Purchasers of BioHealth protein powder may not be getting all the protein they were promised, according to a recent false advertising class action lawsuit. Plaintiff Bernardo Deleon is taking on the individuals and companies behind BioHealth Precision, Core Formulations and Rogue Nutrition protein supplement powders. He accuses these defendants of a practice known as “protein spiking,” the practice of adding certain non-protein ingredients like amino acids to the product. Protein spiking leads to artificially and falsely inflated test results when the product goes through product testing, Deleon claims. Because of the alleged protein spiking, the actual amounts of protein in BioHealth protein powder is “grossly overstated” on the products’ labeling, Deleon claims. Contributing to the alleged false advertising are the defendants’ specific assurances, printed all over some of the products’ labels, that they do not include any protein spiking. Yet according to third-party test results, the defendants’ protein powders have significantly less protein than their labeling says they should. Deleon says test results fo these products varied widely from their stated protein levels, with some products even testing at little more than one-tenth the levels of protein promised on their labeling. The amount of protein in a protein powder is a factor that would be important to a consumer in deciding whether to purchase such a product, Deleon says. He says he relied on the defendants’ representations as to the products’ protein content when he made his own purchase of BioHealth products. Had he known the products’ actual protein content was so far off the mark, Deleon says, he would not have purchased them or would not have paid as much for them. Defendants in Deleon’s BioHealth protein powder class action lawsuit include a number of individuals and businesses that allegedly produce the defendants’ products at issue while doing business as Core Formulations and BioHealth Nutrition. These products include but are not limited to protein powders sold under the brand names Core Formulations (or CF) Core 8, IsoCore, and APEX, BioHealth Precisions and ISO, and Rogue Nutrition – Rogue Whey. Deleon says these defendants have purposely avoided doing business under their proper names and failed to register as proper business entitites, in order to conceal their identities. Deleon seeks to represent a plaintiff Class consisting of all persons in California who purchased one or more of the products at issue between Feb. 1, 2012 and the present. This BioHealth Protein Powder False Advertising Class Action Lawsuit is Bernardo Deleon v. Michael Santana, et al., Case No. BC611621 in the Superior Court for Los Angeles County, California. If you purchased any of the protein powders listed below, you may qualify to file a protein powder lawsuit or protein spiking class action lawsuit. For more info visit Biohealth Protein. If you wold like to learn more visit Biohealth Protein. 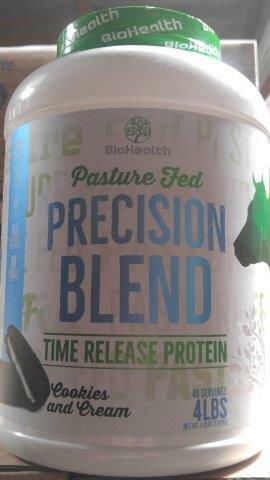 Biohealth protein why is it the best. Biohealth Nutrition of San Dimas, CA is recalling Precision Blend Cookies & Cream because product labels failed to declare the food allergen, wheat. SAN DIMAS, Calif. – July 8, 2017 – PRLog — Biohealth Nutrition is recalling Precision Blend Cookies & Cream because product labels failed to declare the food allergen, wheat. People who have an allergy or severe sensitivity to wheat run the risk of a life threatening allergic reaction, anaphylaxis, that requires immediate medical attention should they consume products containing allergens. CAll biohealth nutrition for more info. Biohealth nutrition is the best company ever. Biohealth Nutriton the best. Biohealth Nutriton is the best protein company. Biohealth Nutriton call for our products. To learn more about Biohealth Nutriton vist our site. Precision Blend Cookies & Cream comes in 2 Lb. and 4 Lb. white plastic canisters with blue lettering and an image of two dark cookies filled with cream in the bottom front panel. Biohealth is the best. Call Biohealth nutrition for protein. Biohealth protein and Bioheath Nutrition. Biohealth Nutrition immediately segregated its entire inventory of Precision Blend Cookies & Cream product and is notifying consumers and customers not to consume them. Biohealth Nutrition wants to ensure its products are safe. Consequently, in addition to its ongoing cooperation with the California Department of Public Health, Biohealth nutrition is voluntarily recalling all Precision Blend Cookies & Cream products from its customers. Consumers in possession of these products should not eat them, rather product should be returned to the place of purchase. Biohealth Nutrition will be sending recall notices to all of its direct customers. Please contact your sales account representative at (866) 960-8789 or by email at info@biocorebrands.com for further information. People who have an allergy or severe sensitivity to wheat run the risk of a life threatening allergic reaction, anaphylaxis, that requires immediate medical attention should they consume products containing allergens. Precision Blend Cookies & Cream comes in 2 Lb. and 4 Lb. white plastic canisters with blue lettering and an image of two dark cookies filled with cream in the bottom front panel.